Does personalization really work? Statistically sound research and real-life campaigns tell the story. 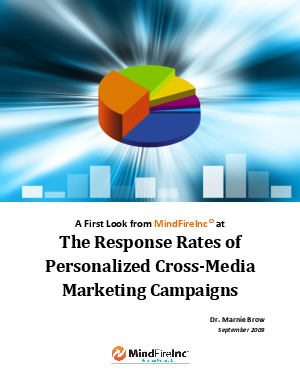 In the last few years, customized, personalized marketing campaigns have been posting strong results compared with traditional, static campaign styles. This report provides a look at some of the data and conclusions that support that claim. First, summary content from three essential and informative reports on marketing campaign's response rates, the DMA, Print on Demand Initiative (PODi), and the CMO Council reports, is reviewed. Next, results from well over 650 cross-media campaigns across 27 vertical markets, randomly selected from MindFireInc's database of several thousand real life campaigns are analyzed to provide a solid base of actual performance data and information, such as: The average response rate across all industries with 10 or more campaigns was 6.5%; Not-for-profits realized an average personalized URL visit rate of 7.7%, and an average response rate of 4.5% over 28 campaigns.